The World Bank won’t decertify antigay parents group PFOX as a beneficiary of employee charity, but the Bank won’t match employee donations to the antifamily organization, either — for now. Metro Weekly reported last week that the bank — part of a multibillion-dollar international foreign-aid institution that is governed by its 187 member countries, with significant influence from the world’s economic superpowers — had admitted Parents and Friends of Ex-Gays to the bank’s Community Connections Campaign. The Campaign matches employees donations to a list of authorized charities that claim to serve employees’ local communities. 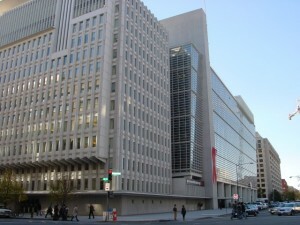 The World Bank Group employs approximately 8,000 workers at its headquarters (pictured) in Washington, D.C. These staffers may choose the CCC as a means for automatic charitable donations from their paychecks. PFOX, however, has no documented ex-gay constituency in the D.C. area and, despite Bank requirements, provides no inclusive charitable services. No such removal is yet forthcoming. Indeed, the Bank has claimed that “diversity” is the reason why an antigay, pro-bully group was added to a charity list that includes the pro-equality parental support group Parents, Families and Friends of Lesbians and Gays (PFLAG). While PFLAG is a legitimate support group for parents, with support from the mental-health community, PFOX is anything but. As Truth Wins Out notes, a former PFOX board member, Richard Cohen (who still serves as a therapy guru to the organization), was intimately involved in efforts to create legislation in Uganda that would punish homosexuality with the death penalty or life imprisonment. Furthermore, the director of PFOX’s Speakers Bureau, Arthur Abba Goldberg, is a convicted felon who was sentenced to a year and a half in prison for bilking poor communities with bond schemes. And PFOX has also had its tactics condemned by the worldwide psychological and medical profession, with leaders from the organization being thrown out of professional groups such as the American Counseling Association for violating ethical protocols. According to TBD.com writer Amanda Hess, a Community Connections Fund rep wrote to one concerned employee that, despite the Bank’s supposed commitment to a safe workplace, “it does mirror society and so there are staff with many differing viewpoints to accommodate which makes for a delicate balancing act” in the Bank’s charitable policies. Hence, inclusive pro-safety charities are to be balanced by exclusive pro-harassment groups with no demonstrated charitable purpose. For this year’s Community Connections Campaign, Bank-matching funds will be provided to those organizations that have, through prior participation, established a track record of support with staff. Organizations that have come on the list this year will not be offered matching funds in this year’s campaign, though the Bank will match any contribution that has been made to this latter group prior to today, November 15 2010. We will review the new organizations after one year, to see if they have the staff and community support to warrant a match in the FY12 campaign. Since the Bank management in D.C. is violating its own charitable policies and disrespecting respect human rights in its employee-charity campaign, pressure may have to be applied not only to Bank management, but also to key foreign representatives to the bank. Political pressure from Washington-area local political leaders has also proven helpful in the past. Disclosure: The writer, Mike Airhart, is a former staff assistant of the World Bank Group.